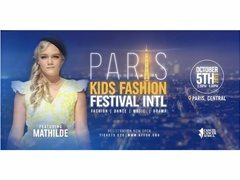 The Paris Kids Fashion Festival Int event, will be holding October 5th, 2019. A great opportunity to allow your kids to live their dreams in front of local and national Media, Clothing Brands and Modelling Agencies. This one-day event will feature a explosive shows featuring international designers. Fee details: £10 registration fee to cover the Charities cost.